Most runners agreed that the Nike Air Zoom Structure 21 had a suitably lightweight feel. Several runners commended the smooth transition that this shoe offered. A good number of testers felt that it had plenty of cushioning. One user said that the 21st version of the Air Zoom Structure secured the foot better than its predecessor. Many agreed that the style and colorways were stylish. One user was appreciative of the air pockets located in the forefoot. He said that they helped propel him forward during his tempo runs. A majority of the reviewers agreed that the shoe was true-to-size. Several testers observed that the toe box had ample space for toe-splay. One reviewer felt that his heel wasn’t fully supported or stabilized. Another tester said that the shoe felt stiff out of the box; she wasn’t glad that she had to break it in. One runner narrated that the angle of the shoe placed downward pressure on the ball of his foot, which resulted in some irritation. A runner said that the insole was not as comfortable as expected. 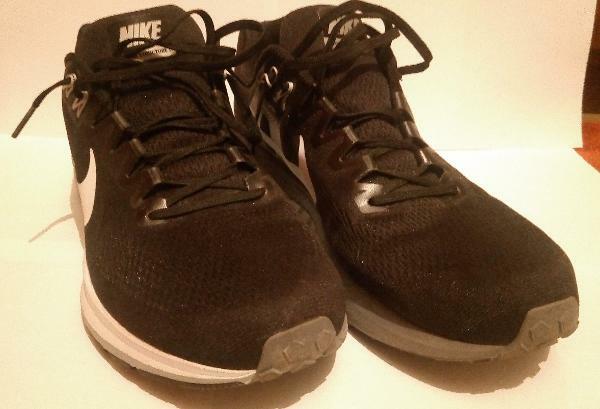 The Nike Air Zoom Structure 21 is a stability road running shoe that provides moderate support. It has received much-needed upgrades to make it lighter and more comfortable to wear. The responsiveness and cushioning from the previous version have been retained. Those who are fans of the Air Zoom Structure 20 should check this one out. Nike Air Zoom Structure 21: Like a New CORVETTE! The Nike Air Zoom Structure 21 has survived for over 20 years in the ultra-competitive running shoe business, not by always being on the leading edge with the latest stuff but, rather by simply using tried and proven technologies, wisely. This latest Nike Structure is a middleweight, stability road running shoe that can be compared to such well-known industry standards such as the Brooks Adrenaline GTS 18, and the Asics Kayano 24. For all those readers who are too busy running and, do not have enough time to read a nearly 2,000-word review...I understand, so here is the gist of it all. The Nike Zoom Air Structure 21 is a medium weight, fairly stiff, yet responsive stability-support category road running shoe. It is well cushioned and, it is very well constructed, with room for your toes and, has proven to be fairly durable. Nike was founded in 1964 as Blue Ribbon Sports, in the U.S. State of Oregon and was originally a distributor of the Japanese built Onitsuka Tiger, running shoes, today known as Asics. Blue Ribbon Sports became known as Nike in 1971. The name “Nike” was borrowed from the Greek goddess of victory. When I first look at any shoe, I take notice of what's most important to me; and this Nike had a roomy forefoot with ample room above my toes. The upper mesh material was positioned with great accuracy; both shoes were the precise mirror images of each other. Every part was perfectly lined up, with not a stitch out of place, including the ones under the sock liner where nobody ever looks. With the "founder's touch" still being evident, the classic and highly effective waffle style sole is still present in most of the outsole…with some minor evolutionary updates. The outsole is composed of primarily Duralon rubber, with BRS 1000 (Blue Ribbon Sports) carbon rubber being used in areas of higher abrasion. The outsole was said to have been designed for flexibility, with "Deep Anatomical Flex Grooves," however I could not find them. This outsole is simply a well-designed waffle style rubber outsole with a lateral side (outside) full-length rubber pad, which runs from the toe to around the back of the heel. This produces a very effective smooth transition and, adds traction. These shoes are actually quite stiff and, initially caused me some concern. The midsole is the heart of any running shoe, all other parts are simply playing support roles. The midsole is made up of two very well-known, time proven foams… Phylon and Cushlon. Nike's Phylon is a lightweight and responsive EVA (ethylene vinyl acetate) foam that has been heated and molded and is used as the medial (inner) side of the outsole, this is the foam that puts this shoe into the stability category. Cushlon is a mix of that very same Phylon material, but with the addition of top-secret rubber additives, this foam is used in the lateral (outer) side of the midsole. This is the foam that gives this shoe its characteristic bounce and liveliness. These two foams are fused together in what at one time was called "Dual Fusion," and now renamed the “Dynamic Support System.” I always liked the "Dual Fusion" name; it sounded descriptive and promising to me. It is reminiscent of the terms we used in the old HOT ROD days like Dual Exhaust, and Dual Quads. I grew up reading HOTROD Magazines and, they still add to the descriptions I use to define things in today’s modern running world. The Nike Structure 21 has a gender-specific crash pad at the bottom of the heel, and along with a variety of colors and sizes, completes all gender-specific considerations. There is also a Zoom Air unit placed in just the right location in the forefoot. By using a single piece of monofilament reinforced Engineered Mesh, with a minimum of overlays, Nike created an attractive and streamlined appearance. Some of the overlays are so thin, they look as if they had been painted on, like racing stripes on a sports car; however, they do help lend structure to the uppers. The Nike logo is the most prominent overlay, and there is a near total absence of visible stitching; other than those needed to neatly attach the tongue. Most of the lacing is fed through loops rather than eyelets; this provides more comfort by disbursing the lace pressure over a wider area…in what they are calling a Strapped-Based-Lacing-System. There are four conventional eyelets, towards the rear/top of the tongue that are used in conjunction with the Flywires. There are a total of only 8 Flywires used per shoe, compared to the latest Nike Pegasus 34 which has 24 Flywires per shoe. The Nike Structure 21 is only a partial Flywire equipped shoe, but I think that the most important Flywires are in place, towards the rear of the tongue. The Flywires begin their journey at the midsole, and then they move up both sides of the shoe to where the laces are waiting to complete a full wraparound of your foot. The tongue is fairly well padded but not plush and, is secured along its sides; making a lace-stay on the tongue unnecessary. There is a thin internal bootie extending all the way forward from both sides of the tongue, keeping the tongue from slipping. There is no external heel counter, rather an internal stiffener is used and, surprisingly seems to work well; heel slippage was minimal…for such an inflexible shoe. The laces are wide, elastic, and comfortable. However, these laces, sadly, did not stay tied for more than 3 miles; they were replaced before my second run. I generally replace my original laces with reflective laces, for after-dark safety, because getting hit by a car going only 25 miles per hour is like falling from a two-story building! Although not a defect, the collar wraps around the back and terminates on either side of the tongue, in an unfinished manner. These unfinished ends tend to hang up the laces. Care should also be taken when lacing a shoe with Flywires, it's easy to miss a wire! The fit will be somewhat different for each person, however certain aspects are constant. And, for me, I would not change a thing for fear of affecting what has got to be a near perfect ride. The forefoot and midfoot conform to the shape of your foot and, the collar holds your heel comfortably with only minor slippage. You can feel the FlyWires pull gently up under your arch when tying the laces. I stepped into these shoes, very optimistically, after having read several reviews and, having used the "COMPARE" feature found on RunRepeat.com. The Nike Structure 21 is so very blue and, has such panache; I took great care trying to not get them wet or muddy, but I was caught in the rain on the last mile; that first run turned out to be the baptism of my new blue Nikes. This area of the state has no mountain ranges but is fairly hill. The Structure 21 helped me on the hills and, there was plenty of heel cushioning when going down the other side of those hills. The forefoot cushioning is amazing; for my weight, these shoes seemed to have been tuned just right. The Structure 21 is not as quiet as the Brooks Ghost 10. Actually, there is a small amount of road noise with each step. However, I have been running faster with these on every run…and not only when being chased by rain! I was very pleased with my new found speed. With my Brooks Ghost 10, I was confident that I always had enough cushioning. With the Brooks Launch 3 and 4, I knew I was confident that I had a lightweight and flexible shoe. However, with these new blue Nike Structures, I had a different sort of confidence; one that had me checking some of the past half marathons finishing-times of others in my age group! I needed to discover what it was that made the Structure 21s so responsive and lively, and I think the answer is to be found primarily in the geometry of this shoe. Despite not being very flexible, these shoes tend to roll easily through the gait cycle. There also seemed to be a bit of a push-off provided at the end of my gait, just before toe-off like a diving board at a swimming pool that reacts when pressed down upon. This provided a little boost at the end of each step, made possible by the front Zoom Air unit, and where it is placed within the forefoot. On easy long runs, where short strides are in use, I could not ask for a better ride. I suppose a quieter outer sole material would be less durable, and a more flexible forefoot would be less responsive. The Structure 21 is a real good blend of these performance characteristics, and a pleasure to run in. This morning was one of those rare days, geese honking overhead, 34 degrees F. and, no wind whatsoever. These shoes are beginning to relax and, they are even beginning to running quieter. They are also wearing well, proving to be very durable. These shoes are beginning to loosen up, becoming more compliant after 50 miles, showing very little outer sole wear and, are still amazingly cushioned. Size Tested 12 D. U.S. / 11 U.K. / 46 E.U., 30 cm. Weight 318 gr./ 11.2 oz. Heel Stack Height 28 mm. Forefoot Stack Height 18 mm. The Nike Structure 21 is the best shoe I've had in many years, excelling in so many areas, cushioning, fit, transition and I even love the color. Personally, I was getting very tired of so many of my favorite brands and models forsaking forefoot and toe box room for streamlined looks. Even simple safety of reflectors; all gone for the sake of savings and, a spreadsheets bottom line. Honestly, I do not think our toes are getting any smaller these days and the roads are sure not any less dangerous with today's digitally distracted drivers. 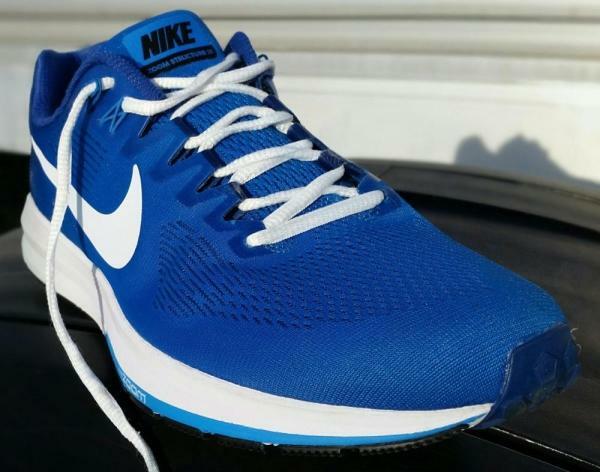 My conclusion, the Nike Structure 21 is a well-mannered and spirited shoe that will be there for you, during many miles of training and, will not let you down on race day. Finally, would I buy this shoe again? YES! Thanks for reading; the rest is up to you. See you at the starting line! ***My thanks to Runningwarehouse.com for taking back the toe-numbing Asics GT 2000 6 and then the New Balance Zante and sending me the Nike Structure 21 instead. They are well worth the wait! Nike Air Zoom Structure 21 is my first ever running shoes made with stability and support in mind. If you are not familiar with stability shoes, they are used to stop you to overpronate. Structure 21 is a well-done shoe with an amazing stability, cushioning and comfort. What I liked a lot when I chose to buy the Nike Air Zoom Structure 21 in terms of design was the color option. After a long time, I was able to choose a running shoe with a simple design, a plain black and white model. It has the design of and shares a lot of technologies with other modern Nike shoes of the same price range. It has a one-piece Flymesh upper which feels and also looks good. On the 2 top eyelets for the laces, you also see the Flywire technology. Together with the elastic band that wraps around the arch, the shoes provide a secure feel and support. Since the Nike Air Zoom Structure 21 is made for support and stability, I thought that it will lack the cushioning. After I tried it, I was happy to see that it's comfortable and provides a high level of cushioning. The high stack combined with the Dynamic Fit technology that is responsible for the stability created an awkward feeling for me when I first tried them. I got used to the stability very fast and now I love this feeling. I really can't compare the security that I get with these shoes with any other that I own or ever had. The outsole has a similar pattern with other Nike shoes. Nike uses two dual density foams for the midsole, Phylon, and Cushlon, and also the Air Zoom air pockets. This combination of technologies and also the improvements that the Structure line got over the years created a really nice cushioning, comfortable and springy ride. I have not run any long distance with them until now, but I feel that they are a really good candidate for a half marathon or longer distances. Inside the shoe, you have an insole that helps you get a nice fit and comfort. I have not used the Nike Zoom Structure 21 for a long time but I feel that the quality of the materials is really good. The rubber outsole is thick enough and I have not seen any kind of wear until now. The upper is flexible and I don't feel like it will get any sign of wear soon. It's also pretty thick, so I don't expect any unusual cuts or wear on the upper level. I consider that the Nike Air Zoom Structure 21 can also be used by more experienced runners, for races and long distance runs. It's way better than any entry or mid-level shoes from any manufacturer. The stability that I got in Structure 21 helped me to be more secure and concentrate on other aspects of the run, like pace and breathing and not on how I put my foot down. They just do that for me and I am sure that that is the right position to hit the ground. The cushioning and the build quality made me put them somewhere on the top when it comes to the shoes that I own. I don’t use them for just a regular short run as I still choose the cushioning of the Hoka One One Hupana 2, but it’s a serious candidate for the next race or fast pace training. I found the shoes to be true to size. I always wear 47.5 European sizes on Nike and this time it was the same. So just order your regular Nike size, you won’t have any surprises. I always try to compare the Structure 21 with the Hupana 2 from Hoka One One, because they are my shoes with the best performance overall. What I get with the Hupana 2 is a higher level of cushioning, a 2 mm smaller stack high in the heel area and only a 5 mm drop. I would love to have the same level of cushioning in the Structure 21. On the other hand, I wish I had the same stability and support in the Hupana that I got in the Structure 21. I feel secure and I love the support provided. They are different types of shoes, one made for a high level of cushioning and another one for support and stability, so it’s hard to compare and choose one. But I am waiting for the day when I will try a pair of shoes that combines the advantages of both. I really like the Nike Air Zoom Structure 21 and I would recommend them to anyone that wants to try stability shoes. They don’t lack the cushioning, they are responsive and can help you to run many kilometers with a smile on your face. Lighter and stronger than the previous version, the Nike Air Zoom Structure 21 offers a great combination of stability, cushioning, responsiveness and durability. A shoe for everyday easy running over any distance. Nike has updated the upper material on the Air Zoom Structure 21. It is now made of a seamless Wrap-knit Mesh which has significantly improved on the ventilation and flexibility. The switch has also reduced the weight of the shoe. The Dynamic Flywire system is still present, but they have been redesigned. More specifically, the wires have been flattened out and widened to reduce the shoe’s weight further, as well as provide a more superior midfoot lockdown compared than the previous design. An internal heel counter that wraps around the Achilles was added. It serves as a structure that gives extra stability to the foot. The Nike Air Zoom Structure 21 has standard shoe measurements. Runners will be able to get the shoe using their usual preference when it comes to length. On the other hand, the width has more options. For men, the standard, wide and extra wide variations are available. For women, the choices are narrow, standard and wide. On the forefoot is the Duralon Blown Rubber, which is also used in the Nike Structure 22. This material is a lightweight synthetic compound that has tiny air pockets introduced during its making. These small pockets help in propelling runners forward during the toe-off phase of the running cycle. Additionally, the Duralon provides a softer underfoot feel while generating traction as the runner goes over different surfaces. The rest of the outsole is covered by the BRS 1000 carbon rubber. BRS stands for Blue Ribbon Sports. Not only does it supply the bottom of the shoe with enough traction to take on several surfaces, but it was also designed to last long. The 21st version of the Nike Air Zoom Structure has a supportive midsole. It is made up of both Phylon and Cushlon foams which have different densities. Phylon is a soft, core foam wedge while the Cushlon was designed to be the carrier foam, enveloping the central unit and delivering support. The combination of both foam densities makes force distribution equal, resulting in resilient cushioning that’s responsive and dynamic. The heel part has a segmented crash pad that absorbs impact upon landing and corrects overpronation. Nike made this pad gender-specific so it can cater to specific weights. The dissipation of landing force results in a potentially more efficient transition through the gait cycle. On the forefoot area is Nike’s Air Zoom technology. Stretched-out tensile fibers were knit inside a pressurized Nike air unit, to produce a snappy rebound. As the runner comes in contact with the ground upon impact, the fibers compress. Then, they spring back to their original state like a rubber band. This mechanic allows runners to feel a forward propulsion during the toe-off. The upper is mainly made up of a lightweight Wrap-Knit Mesh. This mesh is composed of a network of monofilament yarns that allow air to pass through its holes, making the inside of the shoe well-ventilated. The mesh also expands quickly, catering to different foot shapes and delivering a custom in-shoe feel. The Nike check has been embedded as an overlay to give the mesh some structural support. Aside from that, the top part of the shoe is clean and seamless. Nike’s Dynamic Fit system is made up of widened and flattened Flywire cables, the lacing system, and the interior band around the middle of the foot. The purpose of such a design is to support the arch and to enhance the fit, making it more adaptive. Inside is an inner mesh bootie which delivers a soft, sock-like feel to the runner. The bootie improves the in-shoe feel and the supportive coverage. An internal heel counter was added to lock the heel in place minimally. It protects the Achilles from irritation, injury and impact.